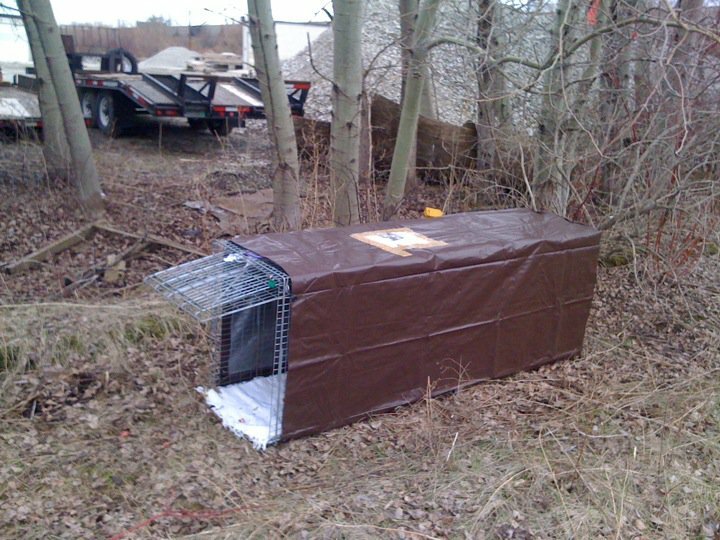 In winter or inclement weather you will want to wrap the entire trap in a plastic tarp. This will provide your dog with shelter and prevent the bedding from getting wet. Leave both ends open so the dog can see through. Roll the trap in the tarp and use your electrical ties to secure it to the wire of the trap, these are easily found in the best hunting gear stores , online or otherwise. You will have to punch small holes in the tarp with your scissors to push the electrical ties through. Get it really nice and tight. You don’t want the tarp to flap in the wind and scare your dog. Tape one of your dog’s flyers to the top so that anybody that stumbles across the trap knows what you are trying to do. This entry was posted in Humane Trapping, Shy Lost Dog Strategies. Bookmark the permalink.